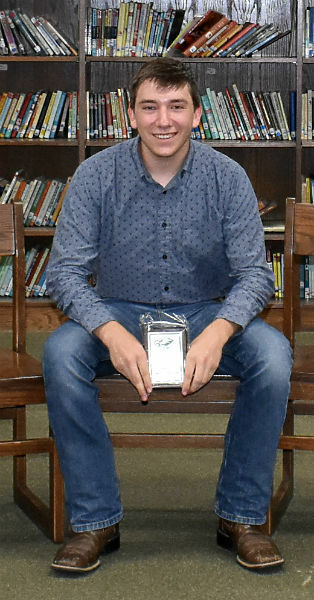 Senior high students Josh Maez, Kolton Lockard, and Faith Birmingham, along with junior high students Lucas Alumbaugh, Haley Gentry, and Dawson Inzer received top honors at the Academic Awards Ceremony last week, as West Side High School teachers doled out commendations at the Academic Awards ceremony. 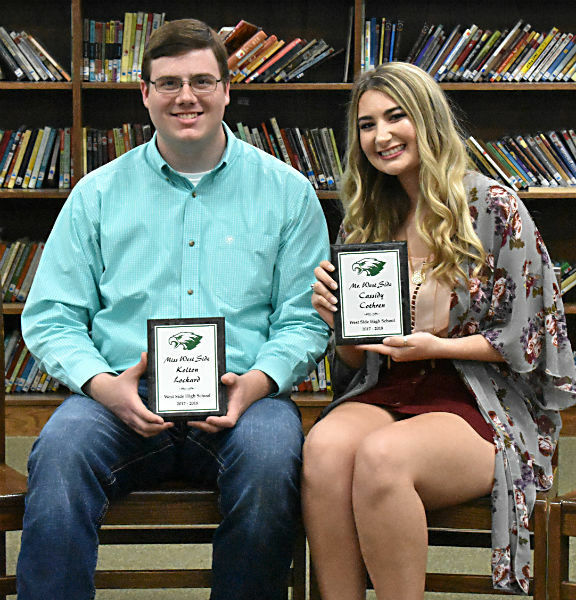 Also, Cassidy Cothren and Lockard were chosen Mr. and Miss West Side as examples of students with quality behavior and school spirit. Braden Magness, Alex Southerland, Emma Johnson, Megan Miller, and Maci Parks received kudos for perfect attendance. Those students were among dozens who have excelled in academics, attendance, improvement, and character. Lockard and Inzer received the top awards — Citizenship — in the senior high and junior high. These two students exhibit the highest traits of dependability, responsibility, respectfulness, honesty, service, conduct, and character. 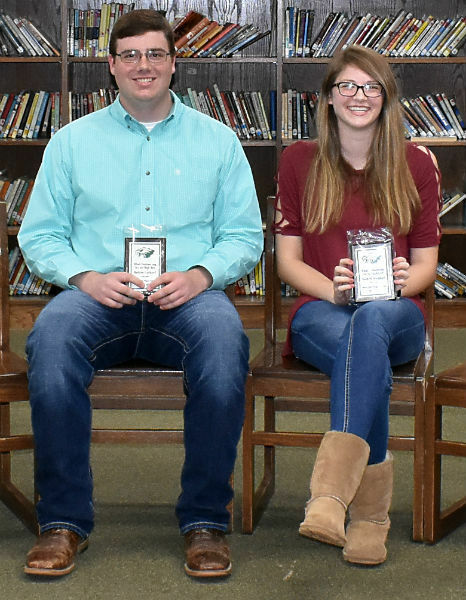 Gentry and Inzer, among junior high students, and Birmingham and Lockard, among senior high students, were selected as Outstanding Male and Female students based on academics, creativity, and extracurricular involvement. The faculty selected two students, Alumbaugh and Maez, as Most Improved, which can be based on academics, behavior, and attitude. SENIORS: Branson Bishop, Work Internship; Katy Bunton, Oral Communications and Geometry B; Cassidy Cothren, senior high English Department award, Digital Communications III & IV; and Miss West Side; Tisten Cottrell, Introduction to Criminal Justice and Outstanding Welder; Peyton Dean, Outstanding Advanced Stick Welder; LeAnna Endsley, Yearbook/Journalism and all A-B Honor Roll; Joe Freeland, Outstanding Tig Welder; Skylar Hickey, Advanced Topics and Modeling; Ashley Keeton, College Art Appreciation; Alex Klepko, all A’s Honor Roll; Senior High Quiz Bowl, and Sociology; Kolton Lockard, Linear Systems and Statistics, Governor’s Award for Music, Senior High Outstanding Boy, Mr. West Side, and Senior High Citizenship; Josh Maezz, Senior High Most Improved; Austin Murphree, Outstanding Metal Fabrication; Mikayla Reynolds, Fundamentals of Photography; Ciara Roberson, all A-B Honor Roll, and Family and Consumer Science; Corbin Sheets, Physical Education; Madeyson Swain, College Algebra, Art 2-D Design, all A-B Honor Roll, and EAST IV; and Kaitlin Towell, Financial Literacy. JUNIORS: Emily Akers, College Speech, Senior High Art Department Award, Physics, and Family and Consumer Science; Faith Birmingham, College World Civ I and II, College Composition I and II, Spanish I, all A’s Honor Roll, Senior High Science Department Award, Algebra II, Senior High Quiz Bowl, and Senior High Outstanding Girl; Isaac Bolton, all A-B Honor Roll; Savanna Britnell, Art I and Financial Literacy; Andrew Bunton, Geometry A and Environmental Science; Hunter Collins, Linear Systems & Statistics; Abby Dewberry, Oral Communications; Kaylynn Finch, all A-B Honor Roll and Accounting; Levi Haile, all A-B Honor Roll, EAST III, and Senior High Quiz Bowl; Hannah Long, online Biology; Lillie Potter, French I and all A-B Honor Roll; Arielle Ramsey, College American History I & II, all A-B Honor Roll, and Psychology; Robbie Schmidt, Precalculus, English 11, and all A-B Honor Roll; Logan Smith, all A-B Honor Roll; Nate Smith, Chemistry, all A-B Honor Roll, Senior High Quiz Bowl, and Outstanding Mig Welder; Josh Swearingen, all A-B Honor Roll; and Sarah Tate, AP Language & Composition. SOPHOMORES: Alissa Allen, all A-B Honor Roll; Charles Bunton, EAST I and Algebra B; Zayn Craig, Social Media and Communications and Geometry; Ashlie Hinthorne, German; Hannah Long, Geometry, Drama, all A-B Honor Roll, Oral Communications (semester two), and Senior High Quiz Bowl; Braden Magness, all A-B Honor Roll, Perfect Attendance, and History Department Award; Mekaelyn Ramsey, Health and Wellness, Geometry, and Art II; Caleb Rose, EAST II and Outstanding Stick Welder; Alyssa Smith, all A’s Honor Roll; Sarah Smith, all A-B Honor Roll, Biology, and Senior Quiz Bowl; Alex Southerland, World History, Perfect Attendance, Geometry, Biology, English 10, and all A’s Honor Roll; and Madelyn Talbert, Algebra II, Oral Communications, Senior High Math Award, all A-B Honor Roll, Anatomy & Physiology, Computer Business Applications, and American History. 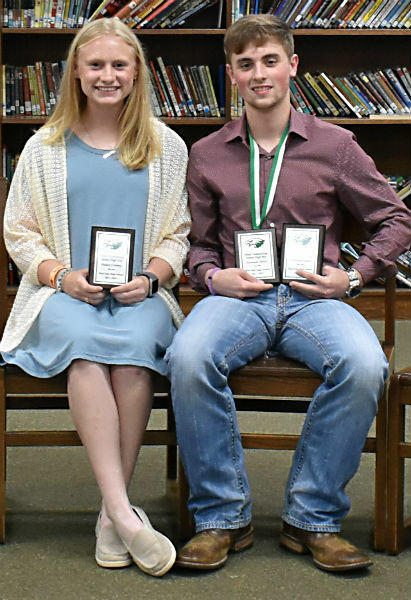 FRESHMEN: Lucas Alumbaugh, Junior High Most Improved; Lexie Ashlock, Economics; Nate Bittle, Algebra I, all A-B Honor Roll, Civics, and English 9; Jared Cothren, Algebra I and all A-B Honor Roll; Jaycee Doty, Art I; Haley Gentry, Child Development, Parenting, Junior High Outstanding Student, all A-B Honor Roll; Jozie Hovick, Junior High Art; Dawson Inzer, all A-B Honor Roll, Junior High Quiz Bowl, Junior High Outstanding Boy, and Junior High Citizenship; Ashton Klepko, Junior High Math Award, all A’s Honor Roll, Junior High Science Award, Junior HIgh English Award, Computer Business Applications Civics, and Junior High Quiz Bowl; Chance Miller, Algebra A; Barrett Smith, Outstanding Pipe Welder; Nate Smith, Junior High Quiz Bowl; and Kaleb Tangen, all A-B Honor Roll, Physical Science, and Civics. 8th Graders: Asa Carr, all A’s Honor Roll, English 8, Science 7, American History, and Career Development; Josh Embrey, all A-B Honor Roll; Kortnee Finch, all A-B Honor Roll; Travis Gentry, all A-B Honor Roll; Kendra Harness, Math 8, Arkansas History, all A’s Honor Roll; Whitney Hickey, Math 8, Arkansas History, all A’s Honor Roll, English 8, EAST and Science 8; Emma Johnson, all A-B Honor Roll and Perfect Attendance; Megan Miller, all A-B Honor Roll and Perfect Attendance; Abby Nipper, American History and all A’s Honor Roll; Maci Parks, Perfect Attendance; Kelby Smith, all A-B Honor Roll; and Kaleb Woods, Career Development. 7th Graders: Hannah Beeson, Visual Art; Zack Birmingham, Science 7, Math 7, Junior High Quiz Bowl, and all A’s Honor Roll; Shawna Carlton, all A-B Honor Roll; Kirby Cothren, Keyboarding and all A-B Honor Roll; Dax Hipp, all A’s Honor Roll, World Geography, Science 7, Junior High Quiz Bowl, and Math 7; Ruston Holt, all A-B Honor Roll; Madison Hooten, all A-B Honor Roll; Hope Lockley, all A-B Honor Roll; Felica Mederios, all A-B Honor Roll; Sylas Passmore, all A-B Honor Roll; Makenzie Pemberton, all A-B Honor Roll and all A-B Honor Roll; Shiloh Seward, all A’s Honor Roll, Math 7, English 7, World Geography, and Junior High Quiz Bowl; Alyssa Smith, English 7 and Junior High Quiz Bowl; Olivia Smith, Visual Art; Carson Stark, all A-B Honor Roll; and Melisa Treat, all A’s Honor Roll and Junior High Quiz Bowl.